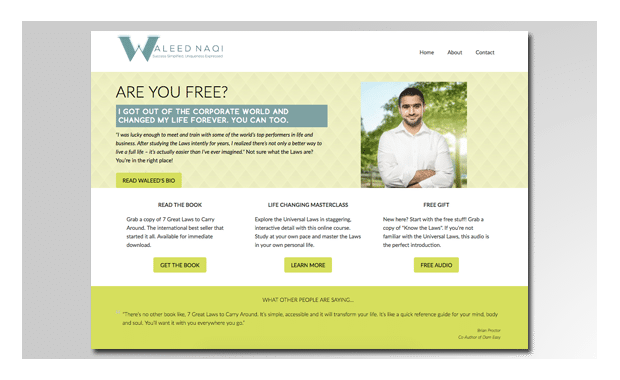 Waleed Naqi is a best-selling author and coach in Kuwait who wanted to scale his ideas and share his concepts with as many people as possible. This is one of several assets we created for him. This brand site serves as a portal for all the projects he has going on at the same time. Sometimes juggling a bunch of different projects can be overwhelming. However with the right strategy, overwhelm can be transmuted into further growth and profits at a level you’ve never achieved before. A confusing and chaotic business CAN become an even-tempered profit machine, if you run it right. Hit us up to chat about YOUR goals and see if a brand site like this is a good fit for your situation.